Nvidia's 800m line of laptop graphics chips? They're so two months ago. Today the company that's been one-upping itself for years does it again with the Maxwell-based Geforce GTX 980m, promising 75 percent of the performance of its desktop counterpart. 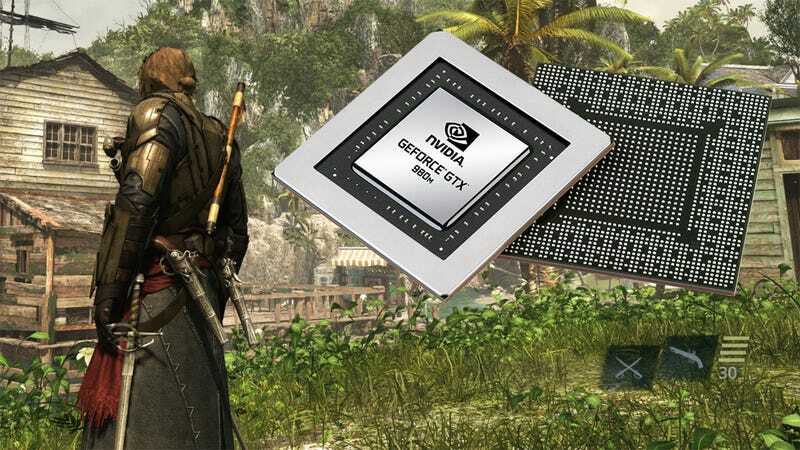 Three-fourths the power of a full-sized desktop GPU might not seem all that impressive from the outset, but if you've been following the progress of laptop graphics for several years, it represents a massive jump over the previous generations. The GeF0rce GTX 980m represents a 40 percent improvement over the GTX 880m, the chip I was raving about a couple of months ago. Based on the Maxwell architecture instead of Kepler (pft), it's more power efficient, more powerful, and will make you more popular with the men/ladies. All of that power and efficiency allows Nvidia to pack the 980m with impressive new technologies. There's Voxel Global Illumination, which is a fancy way of depictuing indirect lighting. Multi frame sampled anti-aliasing is a high performance variant of MSAA. I'm most intrigued by this Dynamic Super Resolution technique, which I'll let Nvidia explain. Dynamic Super Resolution technology enables games to be rendered at 4K or other high-end resolutions and then scaled down to the native resolution on the user's display using a 13-tap Gaussian filter. The resulting image is much higher quality than simply rendering directly to 1080p. That I'd like to see. And I will see, as I've got a loaner unit heading my way from MSI (again) so I can kick the new chip's tires. Hopefully I'll get that done before Nvidia releases the next one, dammit. Oh, and there's also a slightly less powerful 970m, but no one really cares about it, as the 980m is 10 higher. Poor 970m. As per usual, laptops with these two chips in them are now available from every gaming laptop builder in Nvidia's good graces. MSI, Origin, Digital Storm, Maingear, Asus, MSI again because why not. They really need to stop sending out releases about these things and just let us assume unless told otherwise.